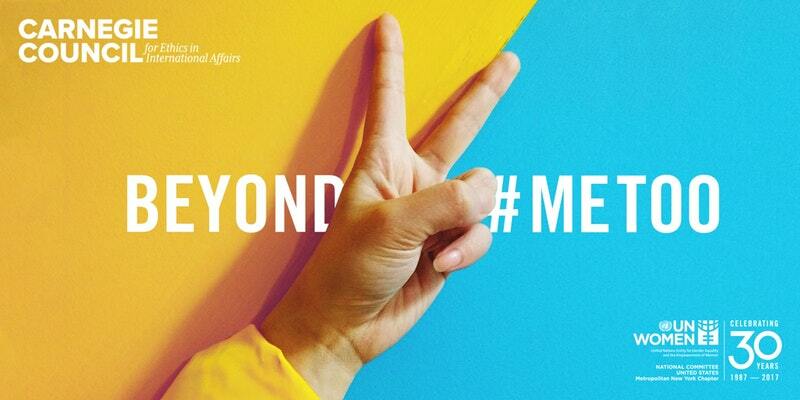 Please join the Metro NY Chapter of the USNC-UN Women for "Beyond #MeToo: An Open Dialogue Between Men and Women" on Thursday, March 22 from 6:30–8:30 pm at the Carnegie Council for Ethics in International Affairs, during the UN's Commission on the Status of Women. Experts will discuss the state of gender equality and sexual harassment in the workplace and will explore strategies, ethical principles and actions that individuals can take to create positive change. To reserve your seat, please make a suggested donation of $25, after which you will be emailed an access code to claim your seat. Space is limited and there will be no tickets at the door. If you have any questions, please email membership@unwomen-metrony.org.